Ever since Marco Polo brought its wonders back to Europe in the 13th Century, westerners have been fascinated by the Far East and its cultural charms. The Chinese brought a fresh perspective to the art world, not only with their techniques but also with the materials they employed, and collectors were soon scrambling to snap up pieces of their finest. All this comes to light from March 13 to 21 with the staging of Asia Week New York, a collaboration of Asian art specialists, auction houses, museums and Asian cultural institutions in NYC. Bidsquare will feature a number of Asia-focused sales during Asia Week, starting off with Waterford’s Art & Antiques Auctioneers’ Fine Asian & Western Works of Art Auction on Friday, March 13. Jade has a special significance in Chinese history, comparable to gold or diamonds in the West, and was used for the finest objects, cult figures, and grave furnishings of the imperial family. 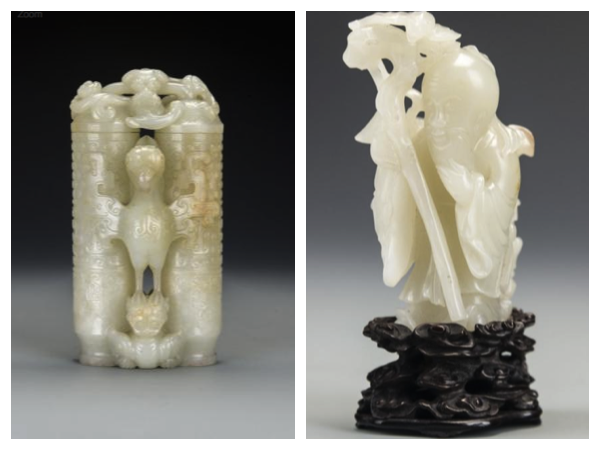 Lot 82 (above left), an exquisite White Jade “Champion Vase” from the Beijing workshops of the 8th Century Qianlong Period, is one of the real stars of the sale, with an expected sale price up near $150,000. The Portuguese introduced tobacco to the court at Beijing some time during the mid- to late-16th century and by the 1800s, use of snuff and snuff bottles had spread through all levels of society. Lot 19, a Peking Glass with Blue Overlay Snuff Bottle, was made in the 19th Century and comes mounted as a pendant on a five-strand faceted turquoise bead necklace. Hand fans have long been a part of Chinese culture – in fact, the oldest in existence goes way back to the 2nd Century B.C. Lot 210, a silk fan leaf depicting an autumn landscape, is a classic example of the work of Xiao Xun (1883-1944), a native of Anhui province who lived and worked in Beijing in the early 20th Century.